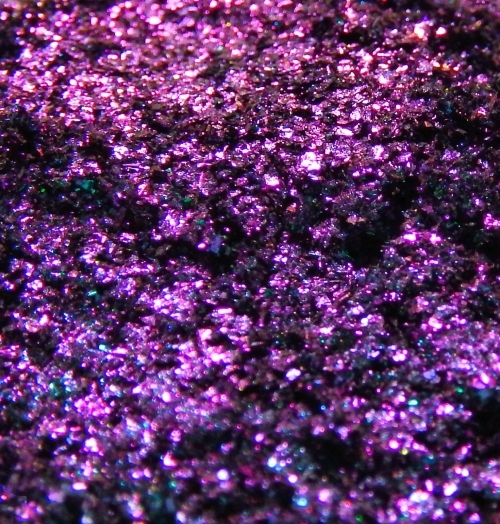 This shade is a rich deep teal green, which turns blue-violet, to bright pink, then to a coppery gold at a sharp angle, filled with coordinating sparkle. This shadow will require a sticky base! 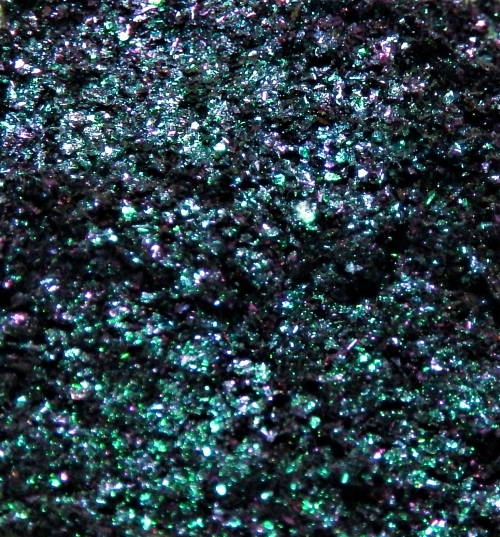 Apply lightly for a shimmery and sparkly shadow, apply heavily for a glittery metallic effect. These are not free-flowing powders; see the category page for ingredients. For a lipstick with similar color change, see Siren's Call. This shade is the bottom swatch, applied over diluted Pixie Epoxy. Not lip-safe. 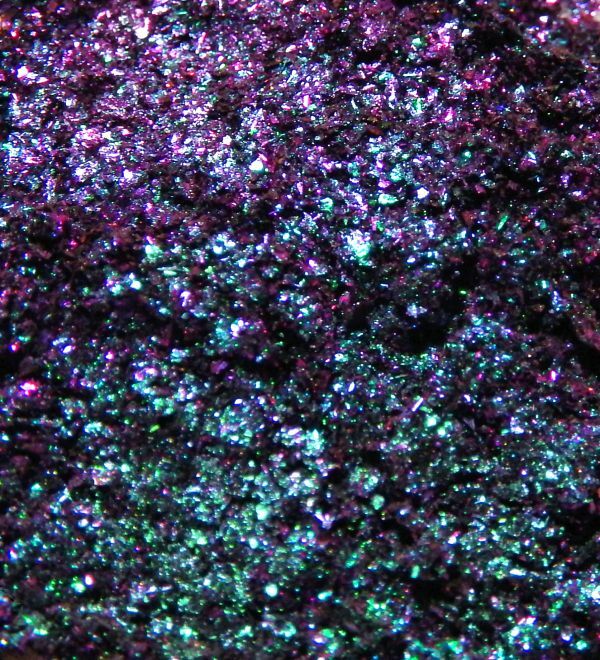 The large-particle sparkle in this is not gritty or abrasive; it's made primarily of very thin silica, aluminum, and synthetic fluorphlogopite, which easily flakes apart and doesn't scratch like glitter can. We had this specially produced in cosmetic grade and size for our company. Bright sunlight can wash out the effect and colors, so we recommend indoor incandescent lighting or indirect sun for photos. Initial color, in this case green, is when the product is viewed straight on, and not in close proximity to bright light. As it is angled, or on the curve of eyelids, the colors dramatically change. Due to the specialized ingredient content, these may not perform well over bare skin. A sticky base is not needed under shades lacking sparkle. Important information about the main colorants and pricing: These more intense colorants used in these shadows cost more than 10 times as much as our regular changing colorants, and most available in past years are generally not eye-safe (but are used in in nail polish and enamel paint). There are a few manufacturers who produce these as cosmetic grade, but the end product still has to have a percentage limit, so the loose eye shadows may appear slightly muted or dark in the jar. We do not use sifters; a full size jar is full. People with limited color vision will not be able to see all the shade variations.